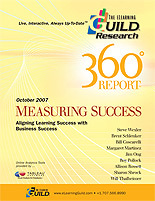 The eLearning Guild has released another must read report. Its also probably the hottest topic in eLearning that most of us don't really like to talk about. Okay maybe its just me, but the butts-in-seats metric and the other silly things we measure to make our training departments look busy is somewhat embarassing. If we are part of a company then we are part of the business. Let's start acting like it! Not sure how? Then check out the report for everything you need to know to move your department into the 21st century. Download the abstract here. And if you haven't done so, then register for DevLearn. Its going to be amazing and Adobe is bringing the big guns. And that means they're serious about US, elearning developers, as a viable market. That might also mean BIG announcements (start the rumors flying now). If you want to hear about whats new and coming soon, or if you want to help influence the direction their tools take in the eLearning Development industry then take advantage of this opportunity to listen and be heard.